Discover Our Featured Hotel, Candlewood Suites located in Greenville, SC. This property is an extended stay hotel. They are owned and managed by Midas Hospitality which is based out of St. Louis, MO and part of the hotel brand IHG, which is the Intercontinental Hotels Group. IHG includes the following hotels: Candlewood Suites, Crowne Plaza, Holiday Inn Hotels and Resorts, Holiday Inn Club Vacations, Holiday Inn Express, Hotel Indigo, Intercontinental Hotels and Resorts, and Staybridge Suites. Construction for this particular Candlewood was completed in October of 2013 when the hotel opened for business. Michael Heater is the General Manager and his Assistant General Manager is Jim Ruby. Both of them have been with the hotel since it began. We exchanged insight and conversation over a delicious meal at the popular restaurant, Firebirds with Michael Heater along with their Director of Sales, Kim Tolbert, Front Office Manager, Stephanie Knauf, and Front Desk Associate, Travis Klimek. You could immediately sense the rapport between everyone. They shared laughter when we discussed their pre-opening days during hotel construction. “We share food too!” they said as they playfully nibbled on food from each other's plates. Travis Klimek commented that he loves working with his co-workers because everyone is close, you are familiar with everyone, and it feels like a family instead of a work group. At a previous hotel where he was employed, that was not the case and it was rare to know the names of all the employees. Michael agrees but adds that if hotel management and the rest of the team do not get along, including the sales department, then your hotel is going to be dysfunctional. Chances are, hotel guests will be able to feel the difference. According to Michael, they aim to run their hotel like a family. 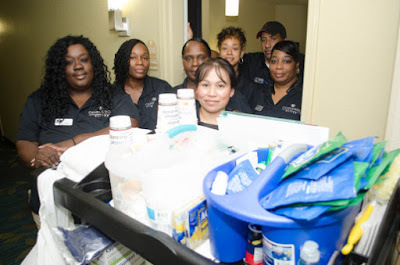 Michael, Kim and Stephanie have a special bond because they endured hours of intense preparation, sweat and manual labor before the hotel was actually ready for business. They did not have an elevator available for use during construction, so four days before the hotel opened for business they had to take dishes and everything that went in all the rooms (including flat screen TV's) up to a window by a lift, and then take the boxes and unpack the items in each room via assembly lines. They compared the crazy momentum they experienced to an Olympic event. Stephanie went on to say that once they bonded, they shared a sense of pride of what they accomplished together. Michael is quick to acknowledge that they have definitely experienced their fair share of challenges during the first several years of operation. The biggest challenge has been brand awareness. People are not always familiar with Candlewood. That took a lot of combined sales effort between Kim Tolbert, Director of Sales and the management. Both Michael and Kim came from transient hotel business models. According to Michael, you have to be more strategic in what you are doing with an extended stay hotel as compared to other hotels that can more easily book one night stays. It consists of a lot of thought and management that involves putting restrictions on reservations. According to Michael, the perfect ratio is 40 per-cent consisting of one to six night hotel stays, and then 60 per-cent being extended stays. During the recent month of September, they reached 39.7 per-cent. It was almost a perfect mix for them. They hit 98% occupancy for the entire month of July, 2015. That means they only had 57 rooms vacant for the month. For the year they are about 92%. Without a strong strategy they could not be successful as an extended stay hotel. Within just two years they are ranked #9 out of 360 other Candlewood hotels on service level. Those other hotels have been more established in their markets. Michael and his team have done this in a very short time. It is imperative that Michael and Kim be on the same page. Fortunately, they get along well in spite of sharing an office, which is a new concept for Michael. As a hotel manger, this is the first office he has shared with anyone. Kim admits they have their moments, but those do not last long and they playfully refer to them as healthy banter before quickly getting back to business. Normal ramp-up for a new Candlewood Suites hotel is two-three years, yet Michael and his team remarkably accomplished it within a short amount of time. Not only did they win the brand award for new hotel, they were also able to refinance thir hotel property within a mere six months. Much of their success can be attributed to leads generated from the front desk associates and Stephanie because nobody initially knew what Candlewood was about. The team agrees that she has been excellent in educating and exciting potential guests. 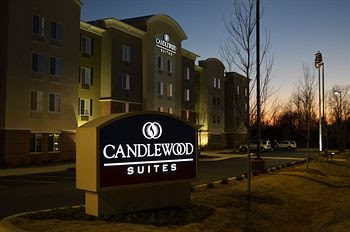 She effectively was able to change their minds about Candlewood Suites. After convincing reluctant guests to try their hotel, Stephanie later learned that she played a vital role in creating extremely loyal guests. Even Michael admits he had limited knowledge about the brand before taking the job, so he knew limited brand awareness would be a challenge to overcome. In addition to brand awareness, another challenge they have experienced is the difference between themselves and their competitors. Candlewood Suites has limited amenities by design. To be more specific, Candlewood Suites-Greenville does not have a breakfast, afternoon snack or airport shuttle. According to Michael, “We have to be on point every time and we have to be very cohesive.” He goes on to say that he feels lucky to have the team they do even though his number of employees is far less than the average hotel. “Almost everybody that has visited from IHG loves us! The VP of IHG stops by and stays at our hotel every time he passes through,” says Michael. Michael is extremely proud of his housekeepers and how well they maintain the guest rooms. He recognizes their hard work and refers to them as the backbone of his hotel. "Without them, we could not be successful," says Michael. Their team had the opportunity to make a housekeeping video for IHG that went out to all their hotels to train housekeepers. The video was filmed on location at Candlewood Suites-Greenville. Kim Tolbert speaks up and says “We all hold each other accountable and to a higher level. We all motivate each other.” Michael agrees. Kim Tolbert, Director of Sales for Candlewood Suites-Greenville has nearly twenty years experience in the hospitality industry. At one point in her career she briefly took a part-time job in a different profession after relocating with her family, but like many other hospitality professionals, she couldn't stay away for long. Kim even once proclaimed that she would never work in a hotel again. After only eight months, she returned to the hospitality industry and can't imagine doing anything else. She loves her job at Candlewood Suites. 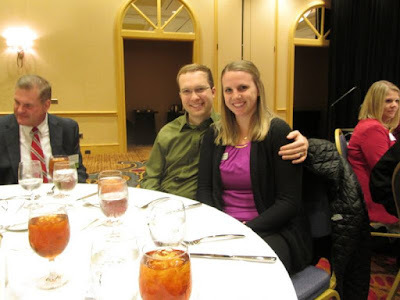 Stephanie Knauf with her husband at the 2015 Upstate (SC) Hospitality Awards. She received Manager of the Year award. 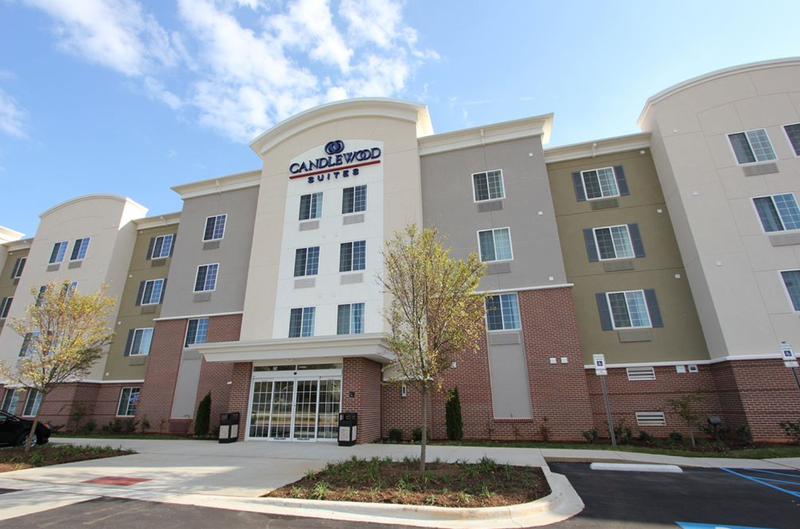 Guest reviews have been extremely significant for Candlewood Suites-Greenville. We asked if their team frequently discusses online reviews for their hotel. They unanimously and simultaneously replied, “Yes! Daily.” They talk about them. They share e-mails and discuss issues. Guests are paying attention. Michael emphasizes that almost everyone that checks-in tell us they have read the reviews. They also say, “That is why we are here.” He stresses the importance of response time from management. Timing also influences a higher TripAdvisor rating. That is why everyone at the front desk has access to reviews so they can make sure someone is responding in a timely manner. Because many people are still learning about Candlewood Suites, Michael stresses the value of having good reviews and is also thoughtful about his personal response to them. He tries to use reviews as a tool to educate guests and thank them for recognizing that their hotel brand is for the smart, independent traveler. 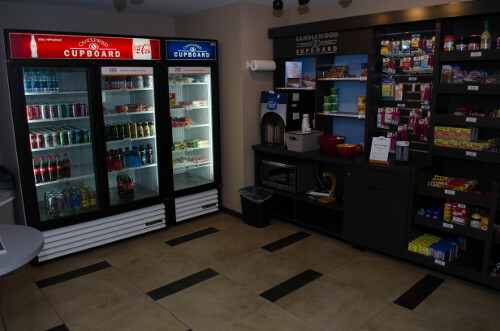 They may not provide breakfast, but they do provide a type of convenience store called The Cupboard, located in their hotel. 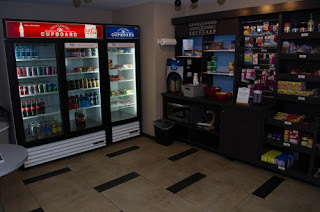 They offer dinners, breakfast foods, sodas, water, and other items a guest may desire to purchase without leaving the hotel property. 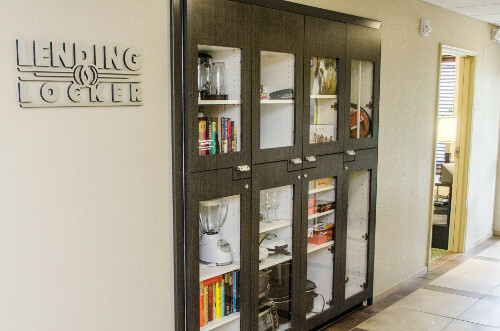 Candlewood Suites is also known for the Lending Locker, which is a brand amenity. As the name implies, they basically provide anything to make the guest feel at home. The guest may borrow items such as slow cookers, blenders, wine glasses, games, books and movies. Extended stay guests especially enjoy this nice perk. Guests also enjoy relaxing in the gazebo located just outside the hotel. This provides a community-like atmosphere when guests may congregate and talk to one another or when they simply wish to use the outdoor grill. 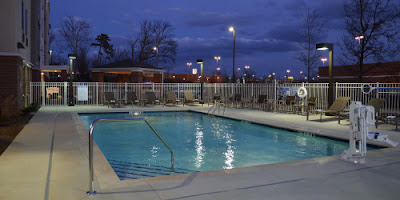 The Greenville Candlewood Suites also has a well-maintained outdoor pool with surrounding landscaped features. Their pool is also equipped to be handicap accessible so all guests can enjoy this amenity. 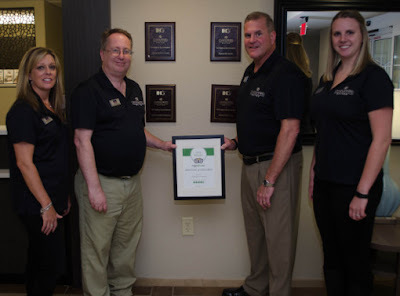 Candlewood Suites-Greenville is officially an award-winning hotel. They were recently awarded a 2015 Certificate of Excellence from TripAdvisor.com. In addition, IHG does a brand conference once a year where they give out five major awards. Beaming with pride, Michael says of their recent awards, "The first one was Guest Service. We won that and were kind of expecting that one, but they called our name again, and again, and again. We actually won four out of five awards. Usually it is great to get just one, but because of all those rewards last year we were just name the Best Hotel That Recently Opened."